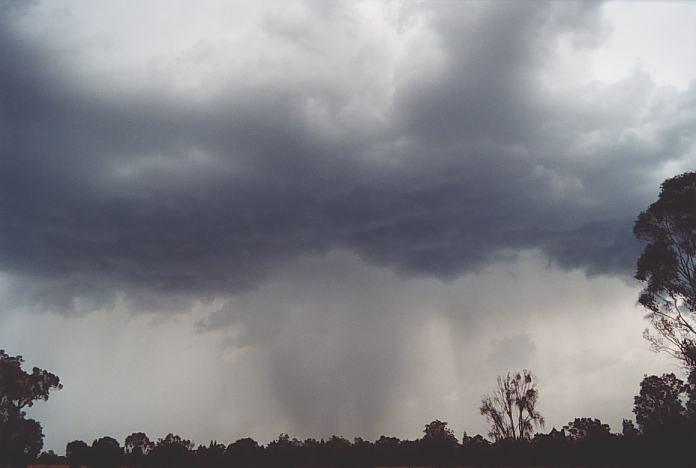 The video clips are linked below associated with the Dora Creek Supercell. As usual, I checked the models using the avnPlotter from a few days prior, and although the target regions were changing, the models were consistent in predicting a significant outbreak. There was colder air aloft and upper level trough as has occurred time and time again this season. Wind shear was to increase particularly during the afternoon. One thing that was supposed to happen and did happen was rapid destabilisation to occur almost over night. So it was no surprise to awake to storms over the Mudgee region and masses of lightning on the lightning tracker. This time both Geoff and Mario were ready to chase. 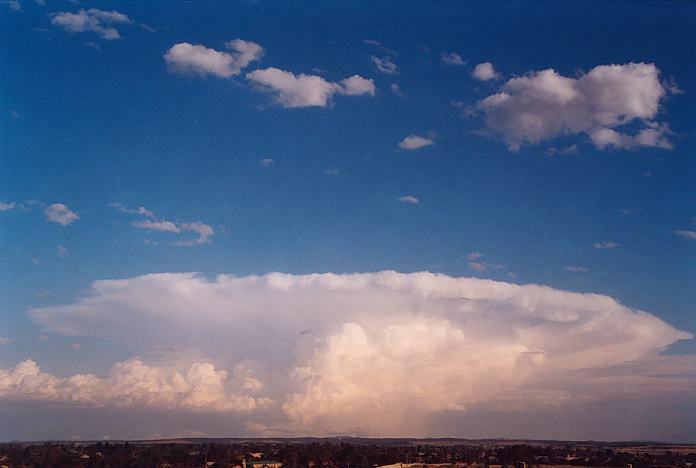 The models had broad region of instability extending from Dubbo to mid north coast where severe storms would fire. I favoured the area near the Coolah Tops to Scone. I also had my mind to the region near Williamtown but the models failed to show a northeaster in the region. 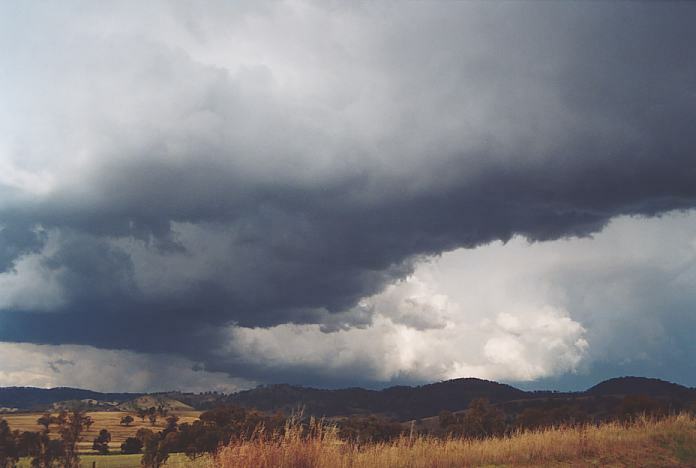 (It turned out there was and tornadoes were reported in this region near Port Stephens). 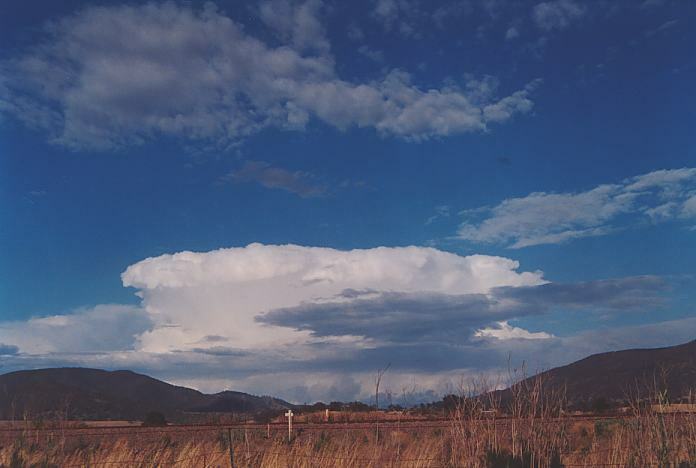 We targetted the region north of Mudgee to be in position for whatever happened. 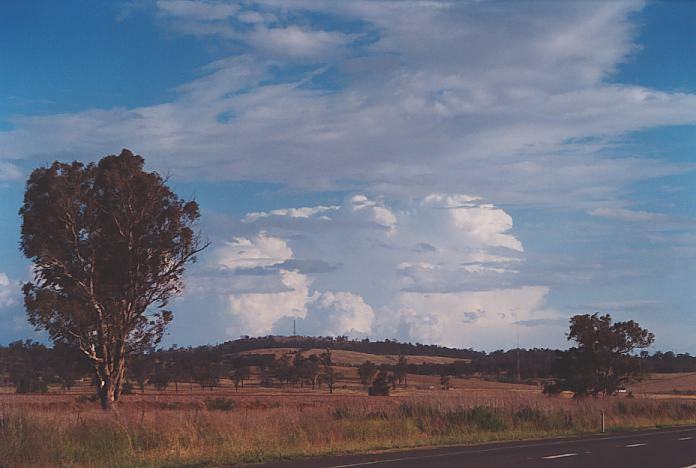 And on the way to Mudgee, the first cell exploded and along the trough line, another took off. It looked impressive and a phone call from Matt Smith confirmed that (he could see the first cells from Singleton in the Hunter). To me it was starting to align into a squall line formation so we tried to stay north although watching any activity that would occur. The structure was certainly ideal with a good moisture profile providing clean bright white tops. 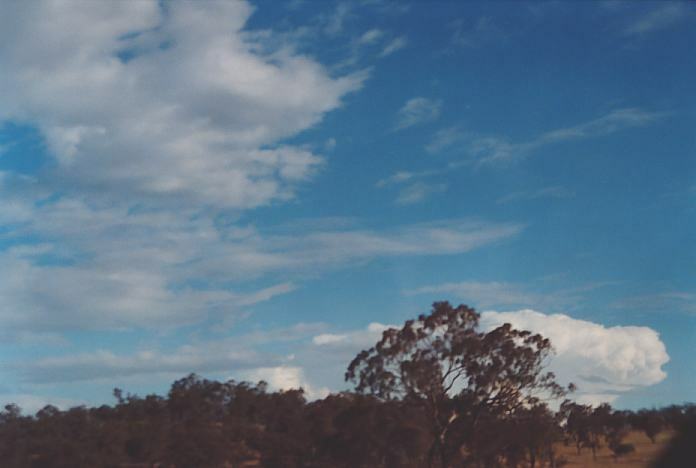 After a quick lunch at MacDonalds (Mudgee) where we met Max King, we headed north. The cells were moving rather fast considering the windshear and lack of lower level backing wind shear. I was not impressed with the northwest winds at the surface. It meant that the atmosphere would soon dry out once the trough moved through. After intercepting a hailstorm just for a bit of fun and relief from the heat, photographs and video were taken of the structure before heading further north. 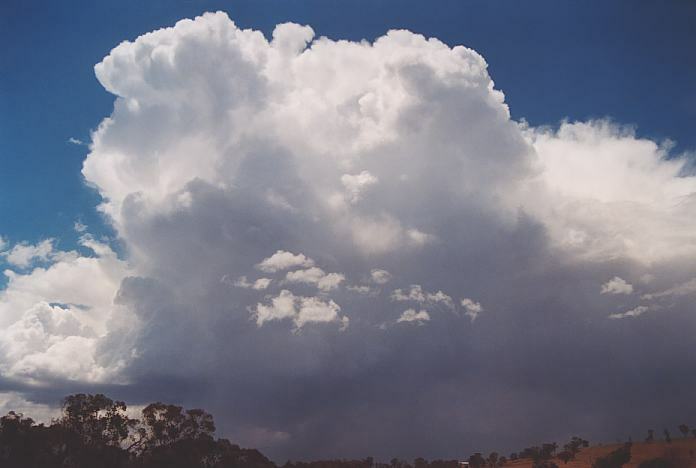 Small hail to 1cm and some microbursts occurred with this storm.We made our way to the intersection of the Golden Highway and the road to Gulgong about 30km west of Merriwa. We remained here to decide which way to go. It was Sunday and therefore to head north meant a long return trip. 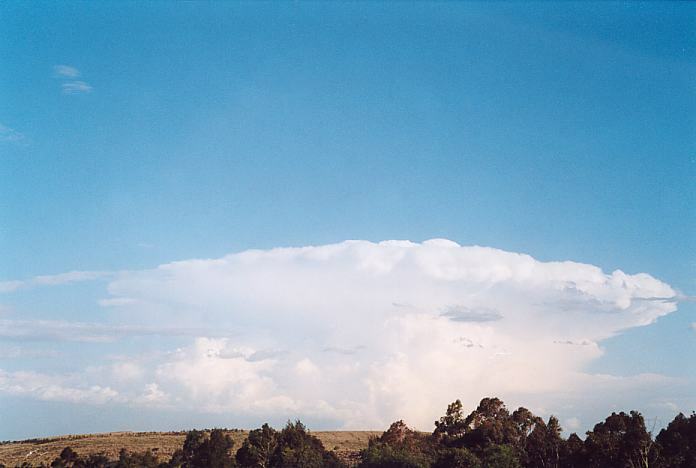 There were cumulonimbus all around but the most impressive were those to the north and northeast. I noted a vapour funnel under a slight corkscrew updraught. The upper level winds were clearly not active yet and were expected to do so later in the day. It was decided to head slightly west from the intersection to see what was going on out west. It certainly had dried out. One quick U-turn and our car was headed east towards Merriwa. 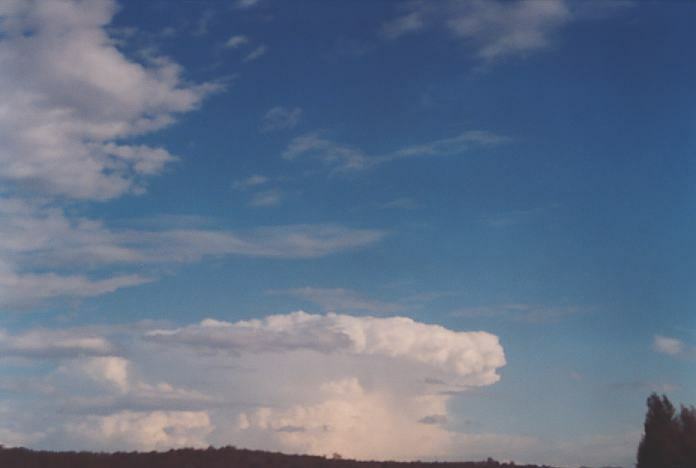 Some distant activity was observed which was south near Sydney and probably extending to the Dubbo area but we continud on east. 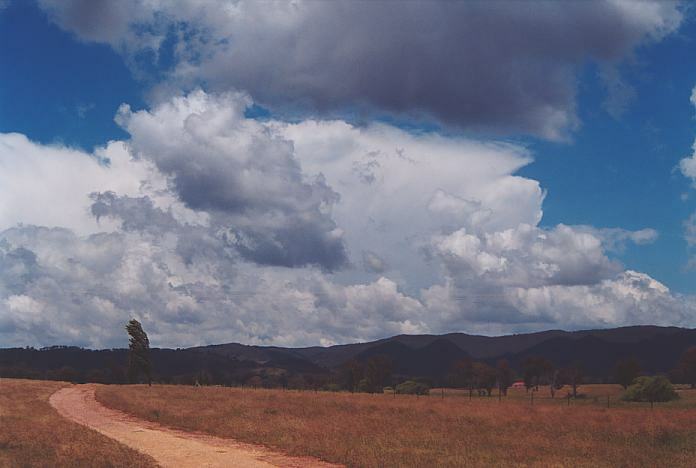 Once in Merriwa, we decided to test out the road to Scone. It went through some good country and the storm to the north was looking rather impressive. We never really got a good vantage point of the persistent lowering on the back of the storm before the rear flank downdraught hid it from view. 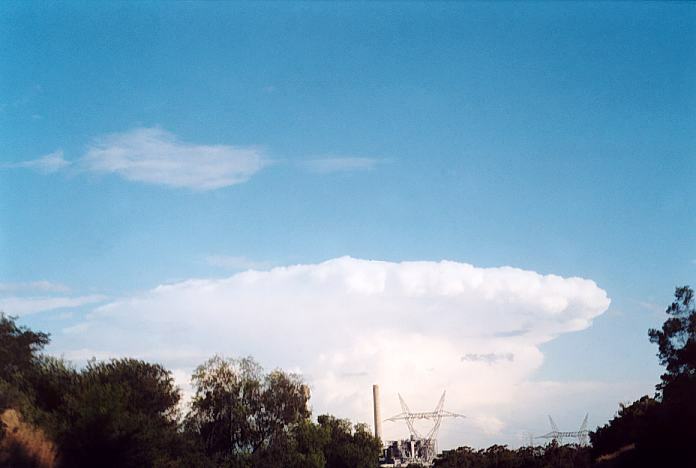 Finally making to Scone, we took the opportunity to photograph and video the impressive back sheared anvil and towering structure. 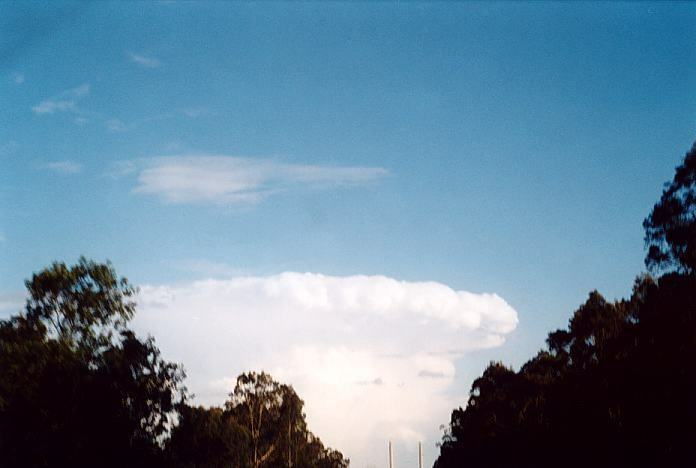 A last attempt was made to intercept it near Murrurundi though it beat us into the hills. 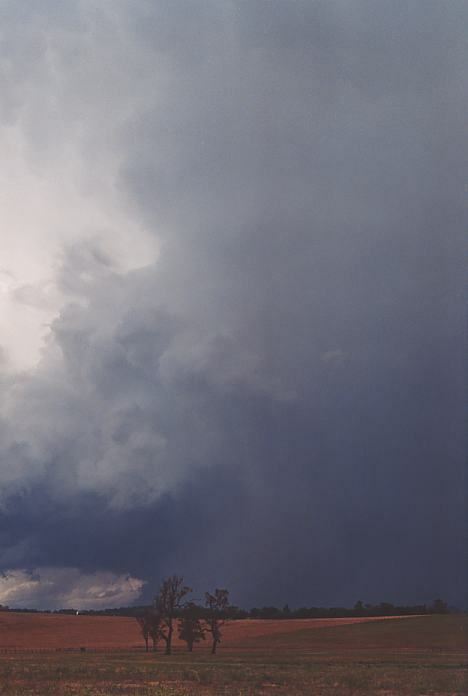 The best we could do was to enjoy the impressive storm structure from the rear. Matt Smith met up with us at Murrurundi and we discussed the day's activity. Then storm chase convergence again with Michael Thompson stopping by. 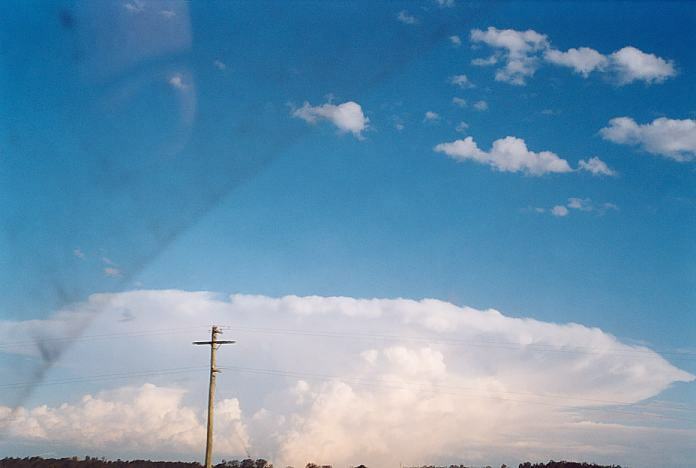 He was on his way to northern NSW and southern Queensland for the next day. 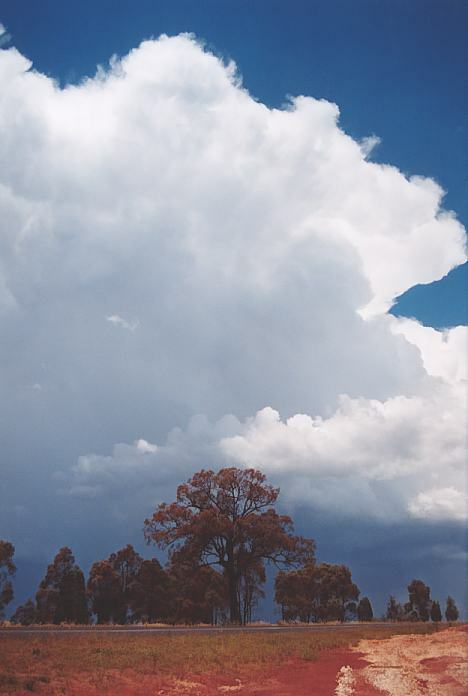 It had certainly dried out at Murrurundi and cloud was developing so the next move was south. 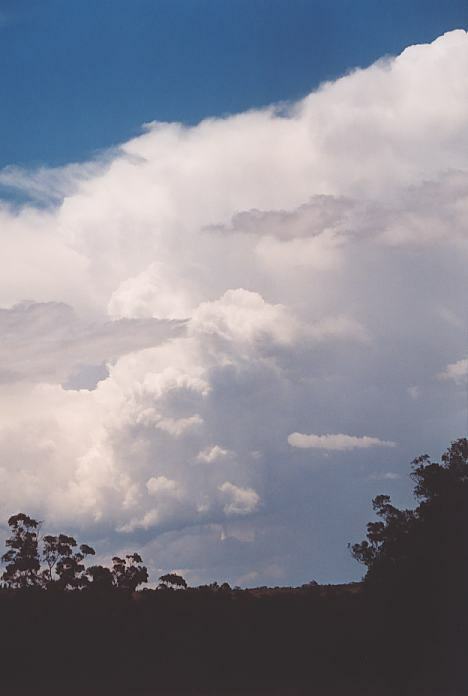 Evaporation from showers from this cloud created strong downbursts with some branches down in Scone. 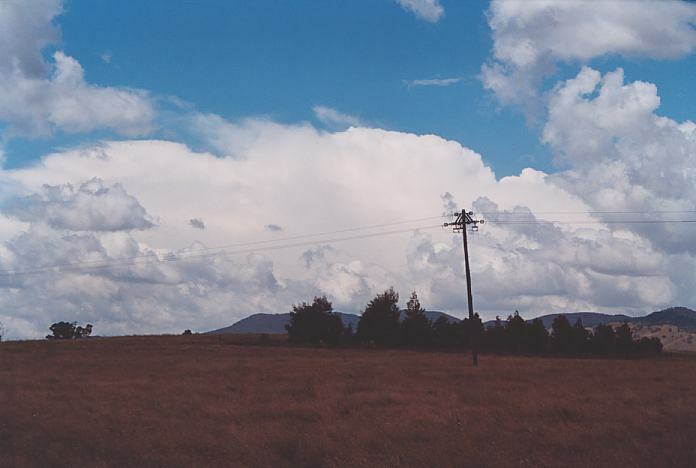 We continued on to Muswellbrook since a distant storm line could be observed to the west and southwest. Sydney had been battered from this line with extensive damage. I didn't feel like waiting around for the squall line system which would be very late and there was still about 3 hours travelling to home. 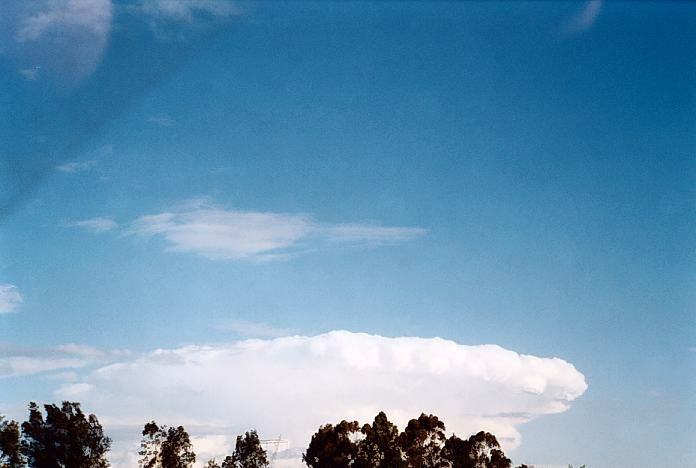 Discussions varied in enthusiasm as to whether the wait was worth it until I took interest of a cumulinimbus that seemed to be remaining high and strong with no backsheared anvil in sight. I simply could not work out why this cell was more impressive than others that had developed along the main dry line. Here are some video clips. 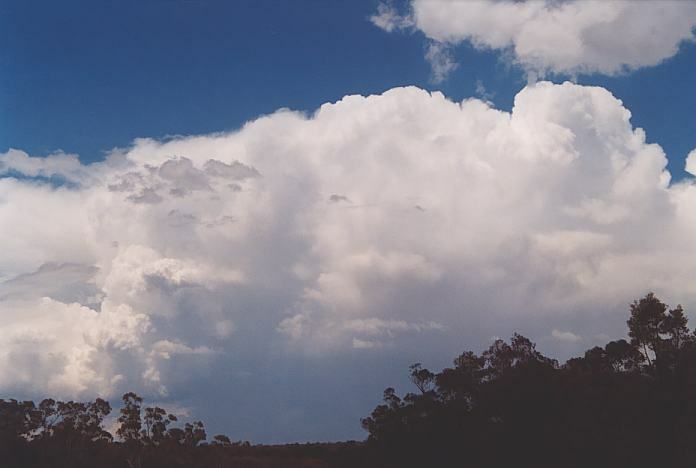 As we made our way through Muswellbrook and towards Singleton, this cell simply exploded with one of the thickest backshear I have seen. It also had the knuckle appearance. I could not contain my excitement as the anvil extended further back and reports came in of severe and supercellular activity from this storm near Dora Creek. We stopped briefly at the hills near Singleton for some quick footage and photographs and headed further southeast and east towards Maitland and eventually Morpeth. 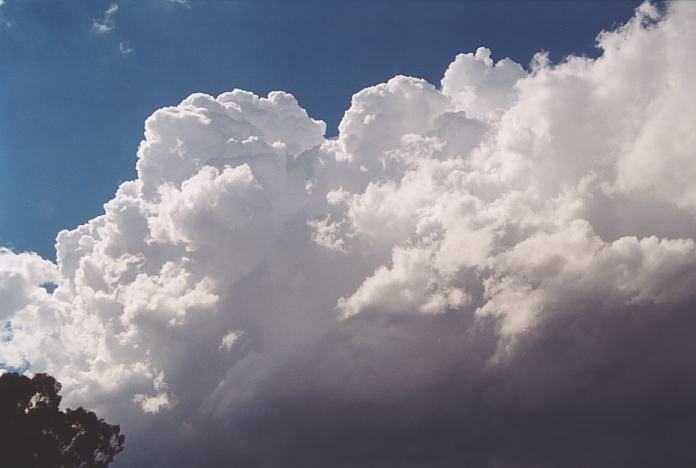 Gradually, altocumulus was developing and began hiding the cell from view. The cell had also moved off the coast. We met up with Tim Crugeon near his place as we watched the southeast change spread its influence through. Yes I forgot about that - there was supposed to be a southeast surge though I thought it would be later. 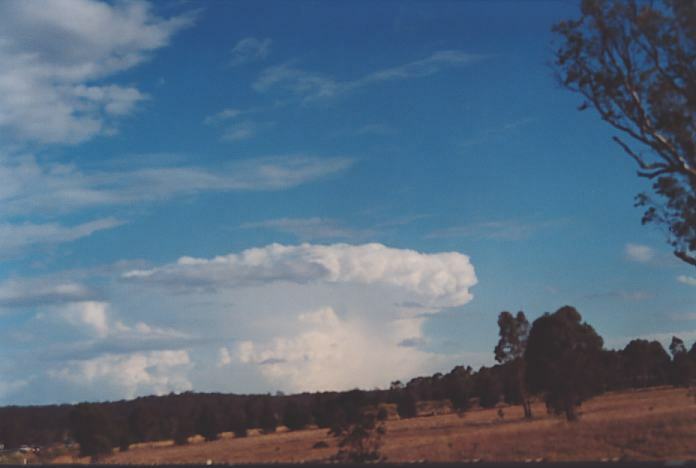 It was this southeast surge that would have created sufficient convergence around Dora Creek leading to this explosive supercell. What was good about this chase was that we did not have many moments of boredom. 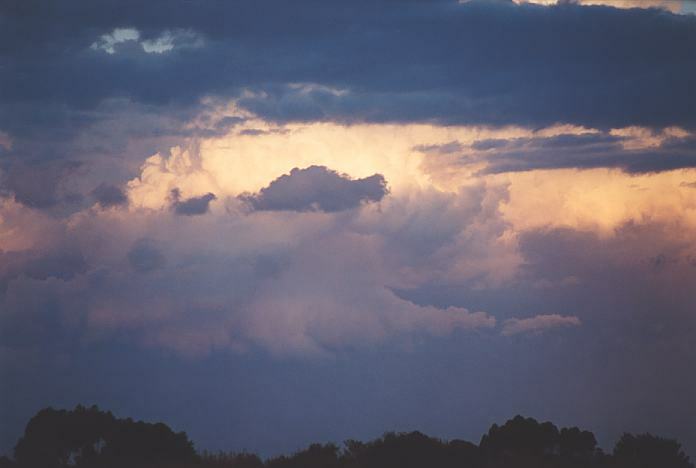 We had chased the storms from the late morning until dusk. 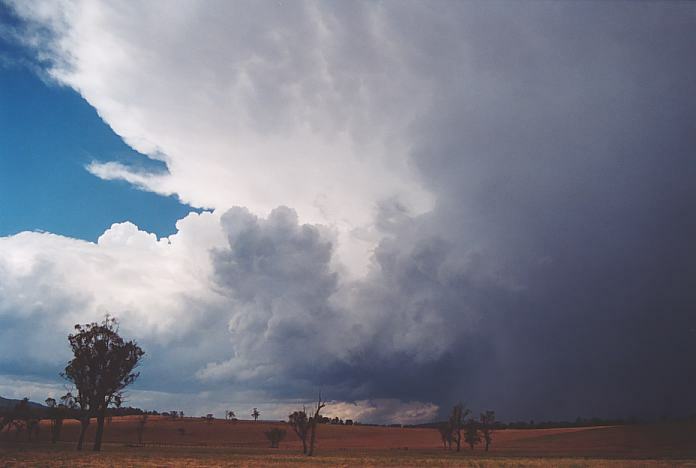 And the Dora Creek supercell will certainly go down as one of my favourites. What an impressive day.